Small town North Carolina, early 1960s, two children who light fires and kill chickens. Unspeakable things happen when a crazy person infects your family, dipping his poisonous finger into your tranquil country life. Luce lives at an old lodge that used to serve as a vacation spot. She lives simply, quietly, and uses her small stipend from the lodge’s owner to keep her afloat. No one comes to stay at the lodge anymore, so she tends to her garden, sits on the porch, and thinks. All is disrupted when her sister, Lily, is murdered and her niece and nephew come to live with her at the lodge. They are disturbed children, not only from witnessing their mother’s death at the hand of her husband, Bud, the children’s stepfather, but also from years of presumed abuse also at his hand. Luce, ever patient, must learn to mother the children, to communicate with them without violence, and continue living peaceably in her Appalachian sanctuary. All is upended when Bud returns to town looking for money. 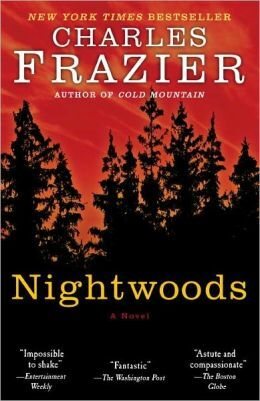 Nightwoods is so tightly written that you cannot skip a sentence. I picked it up thinking it would be a quick read at 250 pages, but no. Each sentence is important. Nothing can be skimmed. There is no punctuation to indicate speech, something that was initially hard to get used to but eventually became a pleasure to read. When the coffee was ready, the sisters rowed themselves opposite Luce on the settee. Each one drowning half a cup at one go and then firing up a smoke. Three difference brands. The unaccustomed caffeine came on like a vibration in Luce’s back teeth and frizzed static into her thoughts. She blurted out some of what she’d come prepared to say. I’ve been thinking a lot about when I was in school, and about the care of children. Lily’s girl and boy live with me now. My mother wasn’t a model for anything but crazy. And it’s not like I’m thinking back and trying to force any of you into being sweet ladies. You had hard expectations. If we were called upon, you made us step up and answer for ourselves. These children aren’t easy. The eldest sister cracked two notes of smoker’s laughter, indistinguishable from a TB cough. Said, You want us to tell you how to be a mother? If so, you’ve come to the wrong place. Sometimes I had to read a sentence twice to make sure I didn’t miss anything, and if that sounds like too much work for you, I get it. However, Frazier is nearly poetic with his writing, so much that it makes me think my own work is elementary. Despite its complexity, Nightwoods is not a story you can leave unfinished. The last quarter of the book flies because it’s hard to put down. Everyone’s in the woods and you want to know who makes it out alive.